Our man Ian in Edinburgh has been enjoying a gig in Glasgow again, this time it was Morrissey. "It's now or never!" proclaimed the biggest British musical genius of the last 25 years at the start of an eagerly awaited final night in Scotland on the latest Morrissey town hall tour. An already warm Glasgow Barrowland may well have appreciated a Cornetto or two however settled for the greatest lyrical couplet of the early eighties "PUNCTURED BICYCLE ON A HILL SIDE - DESOLATE!" We were off and it sounded like it was going to take a hell of a lot to stop us. 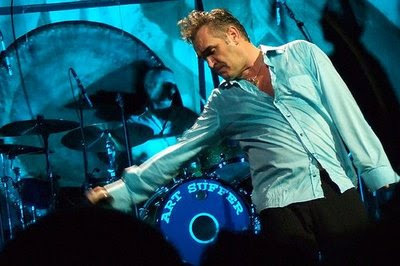 Reports had indicated that the week had gone well - Total respect to Morrissey for taking five nights to play Central Scotland including Stirling Town Hall - not the biggest venue in the world - and Dundee Caird Hall (Seen in may films as part of Moscow - proud moments for Dundee Reds) and then finally two nights at the Barras. Expectation is always pretty high for these live shows however, as usual, and with almost effortless style Morrissey scales these heights like some Alpine mountaineer. It would be very easy for big Stevie to get very lazy - a couple of phone calls to numbers that start 0161 and a few nights in football stadiums could set him up for life but you don't earn your reputation as a genius without continuing to impress with fresh material and new interpretations of the soundtrack for a generation. Morrissey had the mix exactly right - some Smiths classics - including a great semi acoustic version of Death of A Disco Dancer, a track I've never heard live before which ended almost as a homage to local grunge stars My Bloody Valentine in a wall of white noise mixed with powerful renditions of the stand out tracks from Years Of Refusal. When Last I Spoke to Carol blended Morrissey's vocal range with almost Tijuana backing style. The jury is out on whether his cough mid song was a blip or a subtle joke about swine flu ( subsequent cancellation sadly perhaps suggest a cold) It's Not Your Birthday Anymore and I'm Throwing My Arms Around Paris these were the new tracks that went down best with the lyrics as dark as ever almost in contrast to Morrissey's general demeanor as he seems to grow more relaxed with every tour. He took time to banter with the Glasgow crowd, started off the now traditional shirt stampede (no luck again) and made a number of witty observations. However I fear that as a boss, he may be a hard task master. His band are flawless. The much respected Boz Boorer, once of The Polecats gives a complexity to guitar lines which keeps the old sounds fresh - aging slightly, Boz's resemblance to Bill Hayley gave Morrissey's rockabilly style numbers an extra panache. Solomon Walker lends a more edgy punky bass track than his predecessor - the popular Gary Day and Matt Walker came on with the biggest gong and kettle drum seen in Glasgow since some prog rock nightmare in 1973.